In tenth- and eleventh-century England, Anglo-Saxon Christians retained an old folk belief in elves as extremely dangerous creatures capable of harming unwary humans. To ward off the afflictions caused by these invisible beings, Christian priests modified traditional elf charms by adding liturgical chants to herbal remedies. 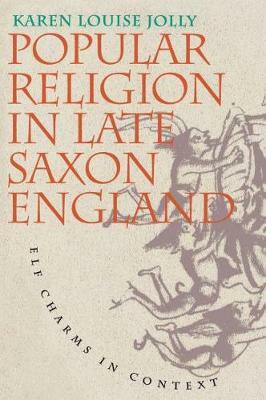 In Popular Religion in Late Saxon England, Karen Jolly traces this cultural intermingling of Christian liturgy and indigenous Germanic customs and argues that elf charms and similar practices represent the successful Christianization of native folklore. Jolly describes a dual process of conversion in which Anglo-Saxon culture became Christianized but at the same time left its own distinct imprint on Christianity. Illuminating the creative aspects of this dynamic relationship, she identifies liturgical folk medicine as a middle ground between popular and elite, pagan and Christian, magic and miracle. Her analysis, drawing on the model of popular religion to redefine folklore and magic, reveals the richness and diversity of late Saxon Christianity. |Greenspan examines the restoration and re-creation of the structures and gardens of Virginia's colonial capital beginning in 1926 with the Rockefeller family, whose aim was to promote a 20th-century appreciation for 18th-century ideals. The meaning and purpose of Colonial Williamsburg has changed over time, along with America's changing social and political landscapes, making the study of this historic site a unique and meaningful entry point to understanding the shifting modern American character.